We are strong believers in giving back to the community and to those in need. Each year, our employees take part in various programs, fundraisers, and events to make sure we are doing all we can to make our community a better place. Some samples of that outreach are found below. Everyone Loves a Jungle Gym! 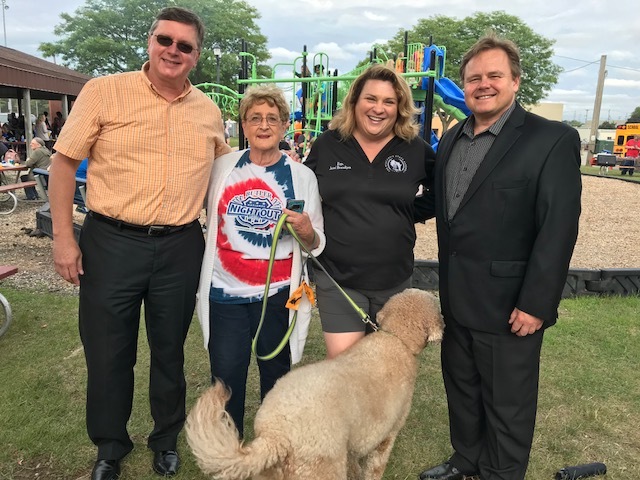 In 2016, the Village of Butler reached out to local businesses to help kickstart a project to build a new playground at the nearby Frontier Park. Only a few minutes away from our corporate headquarters, Western States decided to help with the donation of playground equipment by becoming a bronze level sponsor. While this endeavor took a while to be fully realized, in August 2018, the Florence Liebl Playground was opened to the public and Western States was named on a plaque, honoring all who helped contribute. We are very excited to see the positive impact that this playground has on the local community! When we moved to our Butler location in 1964, we made a commitment to the families that live in this area. We, at Western States, love and support our community and give back in any way that we can. Here is a picture from the ribbon cutting ceremony! I had the great pleasure of hosting an educational tour for a group of high school accounting students on May 3, 2017. Last winter I was approached to see if we would be willing to host an educational tour and discussion for a group of Kettle Moraine Lutheran High School (KMLHS) accounting students. Seeing this as a wonderful opportunity to get give back to the community, and get our story out there, I eagerly accepted the offer. Over the course of several months, I had discussions with Mr. Heider, KMLHS accounting teacher, to better understand his goals about this initiative. We decided it would make sense to give the students a tour, so they could ultimately relate what we do to make an envelope, with what happens in a typical manufacturing accounting department. The morning of May 3rd, Mr. Heider and his 15 junior and senior accounting students arrived in their big yellow school bus, Scott Blanchard greeted them with the plant safety rules, and off we went for a quick plant tour. Once that was complete, we assembled in the conference room for some lively accounting talk! Yes, I said LIVELY accounting talk, after all, is there any other kind of accounting talk? Tom Rewolinski, Jennifer Ross and myself each gave an overview of how our various career paths led us to where we are today. As the students realized, each of us took a very different path to our current position, and in the process, we also conveyed to them that they have many options if they pursue an accounting career. We also talked at length about Western States' business and how the accounting department has a key role in making things run smoothly. The 15 students that were present impressed me immensely with their insightful and relevant questions. Their lively interaction during the Q&A made the morning as much a learning experience for me as it was for them. The whole event was beyond my expectations, mostly because of the high caliber of students involved, and their eagerness to learn about our business and accounting in general. I would encourage anyone with an opportunity to get involved with a similar endeavor to grab it. It is truly a growing experience for us as well as for our audience. Butler, WI people collected over 185 pounds of food to donate food to the Hunger Task Force through on-site donation bins, and coordinated a Bake Sale event that raised over $132 to benefit the Hunger Task Force where employees donated treats to sell and/or buy to enjoy and share with family members. We also again participated in the Adopt-a-Family program this year through Journey House, where we adopted 12 households and provided needed items to the family members in each of these households based on profiles they completed that listed needed items. All gifts purchased were new and gift wrapped. Erlanger, KY people have been collecting food, hats, gloves and scarves to donate to the Northern Kentucky Community Action, an organization 50 years strong that provides developmental and supportive quality essential services and a voice for the families they serve. We should be proud of the above actions as they confirm the type of people we are, the difference we can have on our communities and make Western States a good place to work. Collectively, we have made an impact on other people’s lives. Let’s continue these efforts and extend this Season For Giving throughout the year! The Young Media Alliance has been busy with outreach activities. In February, YMA Chairman Peter Fieoretti of Western States Envelope & Label spoke to a Press Operations class at Harper College, Palatine, IL. The class theme was web printing, and Peter talked about envelope converting, industry opportunities and the Illinois scholarship program. Western States partnered with the Journey House, who's mission is to give education and opportunity to urban Milwaukee residents, to take part in their Adopt a Family Program over the holidays. The Adopt a Family Program helps families in need over the holiday season, many of whom are unable to enjoy the sharing of gifts at Christmas. You can help too! Learn more about the Adopt a Family Program. Each year, a group of Western States employees takes part in the Briggs & Al's Run & Walk for Children's Hospital of Wisconsin. The proceeds from the event go towards Children's Hospital, where live-saving care helps the sickest babies and children every day. Interested in participating? Learn more! The money raised is used to send supplies, presents and cards to employee's family members stationed oversees. After the race, the sausages toured the plant and gave people a chance to get their picture taken with the hometown celebrities. Western States is proud to support all of our veterans and active service members. Whether it's sending holiday gifts to the troops, writing letters to service members, or wearing red on Fridays to support the troops overseas, we believe it's important to remind them of our support. Take a look at the pictures below to see how we continually give back to our service members!